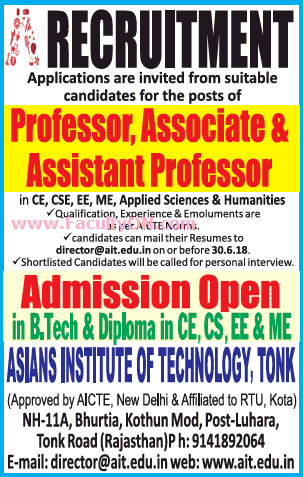 Asians Institute of Technology, Tonk has advertised in THE TIMES OF INDIA newspaper for recruitment of Teaching Faculty- Professor / Associate Professor / Assistant Professor jobs vacancies. Interested and eligible job aspirants are requested to apply on or before 30th June 2018. Check out further more details below. About College: Asians Institute of Technology has been started by Gayatri Devi Shiksha Sansthan, a society that has been working effortlessly for the promotion of Technical Education. This society addresses the need of a diverse group of people; be it the members or a curious mind, looking for food for thought in the field of technical education and social work. Gayatri Devi Shiksha Sansthan came into existence in June 2007 with the objective of delivering relevant quality learning opportunities in accessible, affordable and supportive settings. Highly reputed in the field of promoting technical education, the society strives hard in order to cultivate the fraternity spirit amongst the youth of today. How to Apply: Interested candidates are required to send CV along with copies of certificates and recent PP size photo to the email address given below.